Following the death of more than 1,100 workers in the Rana Plaza building collapse, government and business leaders are struggling to address the complicated issue of improving worker safety in Bangladesh's garment industry. But Nobel Laureate Muhammad Yunus has come up with a simple solution: Workers' problems can be solved with a modest 50-cents surcharge on each piece of clothing from Bangladesh that Western consumers buy. Yunus has proposed creating a Garment Workers Welfare Trust, to be overseen either by Grameen Bank, Yunus' microcredit organization founded by Yunus and for which he won the Nobel Peace Prize, or by BRAC, by some measures the largest humanitarian non-governmental organization in the world, which was launched by Yunus' friend Fazle Hasan Abed. "[W]ith that additional $0.50, then we could resolve most of the problems faced by the workers -- their physical safety, social safety, individual safety, work environment, pensions, healthcare, housing, their children’s health, education, childcare, retirement, old age, travel could all be taken care of through this Trust," Yunus wrote in a Bangladesh Daily Star newspaper article and a column in The Huffington Post late last week. The proposal hasn't been greeted very warmly by labor activists and economists within Bangladesh. Critics said such a surcharge would amount to charity rather than worker empowerment, panning the idea as "the business of begging" and a pie-in-the-sky view of Western corporate benevolence. They also scorned the idea that Yunus himself might have a role in running the trust. 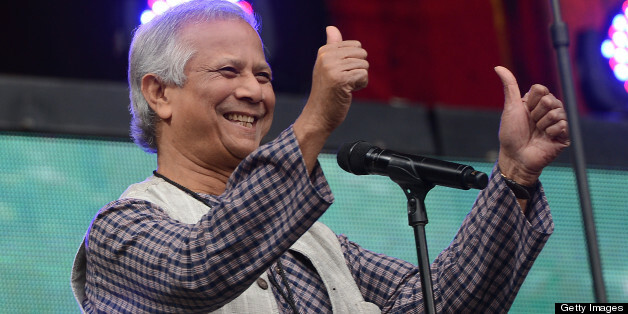 Speaking to HuffPost, Bangladesh economist MM Akash criticized Yunus' proposal as an "external solution" relying on Western companies, rather than an "internal one" accomplished through government or trade unions. He also pointed out that the additional 50 cents wouldn't force the garment companies to spend some of their profits for the benefit of workers. "He is not talking about the trade unions or about owners sacrificing part of their profit," said Akash, who teaches economics at Dhaka University. "His views are utopian. He's finding the solution through a Western paradigm." "And then he talks about a trust run either by BRAC or Grameen," Akash added. "He will control this trust. Who has given him the right to do so?" Akash said the Bangladesh government needs to enforce laws already on the books, such as one ostensibly requiring Western buyers to donate 5 percent of their Bangladesh profits to a workers' welfare fund. He also said the government should immediately survey buildings for safety problems. Bangladesh labor leader Nazma Akter said she was outraged by the idea of such a trust to be overseen by an NGO. She was surprised that Yunus apparently floated his idea without talking to many of Bangladesh's own labor leaders and that he suggested such a significant role for Grameen or BRAC. "We will not accept any trust run by any individual or organization," said Akter, president of the Sammilito Garment Shramik Federation. "The fund has to be only for the workers, who work in factories and die in factories. Why should it be in his name or in the name of his organization?" "Yunus is a world-famous economist," she added. "He received the Nobel Prize, and now he wants to run the trust for workers. Everyone sells out garment workers." Akter said any worker trust should be run by the government and overseen by a board with worker representation. Yunus was recently criticized in both the local and international media after he declined to comment on the arrest of four so-called "atheist" Bangladeshi bloggers, the kind of press crackdown that's common in the country. In April, Yunus dodged a question on the arrests after receiving the Congressional Gold Medal for his work on fighting global poverty. In his 50-cent proposal, Yunus even suggested that, given the improved conditions that would be generated by such a surcharge, clothes could come with tags reading, "From the happy workers of Bangladesh." "The Business of Begging?" asked one typically outraged response posted on Facebook. "Why would you set the minimum wage at 50 cents per hour in Bangladesh and then ask overseas retailers to get a customer [to] dole out a further 50 cent for a clothing to have the label on it that says 'From the happy workers of Bangladesh, with pleasure'? Muhammad Yunus floats the idea as he apparently lines up the apparel industry to serve his ambitious plan." In his column, Yunus suggested the country needed to restore the "trust" and "hope" of foreign buyers. One way to do that, he wrote, would be to send letters to "the chairmen of the foreign companies" highlighting "the social and economic importance of the garments industry in Bangladesh." He suggested that such letters should "thank them for the role they have played in the empowerment of women and in bringing widespread transformation to Bangladesh."